CAN ANYONE STOP SOUTH AFRICA FROM WINNING THE HSBC WORLD RUGBY SEVENS SERIES? South Africa are the team to beat in the upcoming HSBC Singapore Rugby 7s in less than 6 weeks’ time. The South Africa Blitzboks notched up their fourth Series win for the 2016-17 season when they overcame Fiji 19-12 in the final of the Las Vegas Sevens. This is South Africa’s fourth title from five tournaments and they sit 24 points clear of defending Series champions Fiji in the HSBC World Rugby Sevens Series standings. The final itself was a tight match, with Olympic champions Fiji looking for their first tournament win of the Series. 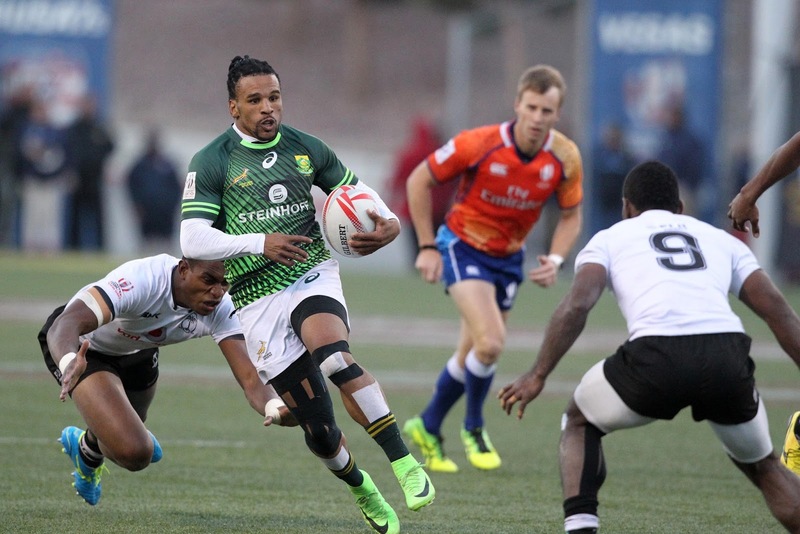 Fiji’s Masivesi Dakuwaqa scored early on in the match following a mistake from Ruhan Nel, but Blitzboks playmaker Cecil Afrika soon replied for the Series leaders, after latching onto a pass from Siviwe Soyizwapi. Chris Dry added a try early on in the second half before HSBC Player of the Final, Rosko Specman scored an amazing individual try to put South Africa clear. Waisea Nacuqu struck back for Fiji late on, but the Blitzboks were already out of sight. "We're happy with how it's been going the last few tournaments and the guys are believing in a system and working for each other," said head coach, Neil Powell to World Rugby. "They are showing a lot of pride in the jersey and the fact that they can play for their country. They showed a lot of composure in the final and managed to take control back in the second half." 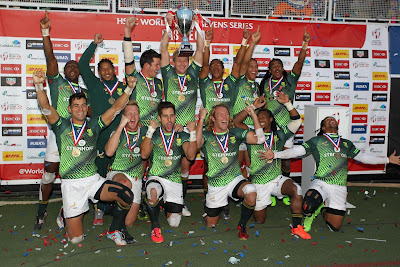 The Blitzboks were series runners-up for four consecutive seasons but have now had their best ever start with titles in Dubai, Sydney, Wellington and Las Vegas. Their loss to England in the final of the HSBC Cape Town Sevens in December remains the only blemish on what has been a perfect 2016-17 campaign. Hosts USA took the bronze after beating New Zealand 19-15, while defending Singapore 7s champion Kenya claimed victory in the Challenge Trophy final, beating Samoa 21-14. Fans of South Africa should grab tickets to the HSBC Singapore Rugby 7s today. Fans can expect two days of “always on” live entertainment, and world-class rugby action from the comfort of air-cooled seats under the world’s largest free-spanning dome at the Singapore National Stadium. They can sing along and mingle with over 50,000 fans, many of them in fancy dress, at the arena’s unique concourse area without missing any on-field action. Fans can join in the festivities at the Fun Zone in the covered 100 Plus Promenade, and enjoy the after-party at Clarke Quay. Parents bringing children along to the Stadium can also opt to leave their kids with professional child minders at the Kids Drop Off Zone for three hours. Two–day Category 1 adult tickets to the HSBC Singapore Rugby 7s are just SGD 150, while family packages for two adults and two children (or under 18s) are an affordable SGD 260. Overseas fans can book their tickets through StubHub and secure travel packages through official travel agents listed on www.singapore7s.sg. Every ticket holder has a chance to enter a lucky-draw that offers a Harley Davidson Roadster motorbike, free flights, luxury hotel stays and other tantalising prizes.